Negotiations over what’s set to be the world’s biggest free trade agreement resume in Auckland this week, with the Australian government insisting the contentious proposal for foreign companies to sue governments will stay off the table. But non-government observers say aspects of the proposed powers are likely to be incorporated in the words of the agreement to be refined by officials. 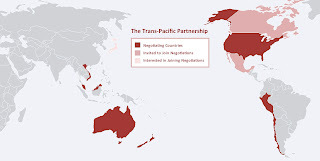 The Trans Pacific Partnership will encompass eleven states from all edges of the pacific including Australia, Brunei Darussalam, Canada, Chile, Malaysia, Mexico, New Zealand, Peru, Singapore, the United States and Vietnam. Japan is considering joining at a later stage. The Australian government has said it will not be party to the agreement if it includes a so-called investor state disputes settlement clause, something insisted on by the United States and obtained in each one of its free trade agreements apart from the one with Australia. Such a clause would allow companies who believed an Australian law had harmed their ability to invest in Australia to take their dispute to an extranational body with the power to overrule local laws. Philip Morris International is attempting to use such a clause in the Australia Hong Kong investment treaty to declare invalid the plain cigarette packaging law that came into force on December 1. “Many aspects of the wording to be nutted out this week touch on investor-state relations,” said Sydney university trade specialist Patricia Ranald who is in Auckland for the negotiations. Trade minister Craig Emerson said Australia’s position remained unchanged and said he understood the proposed clauses were not to be discussed in Auckland. “This is about officials deciding on wording, so that ministers can consider bigger issues in future meetings,” he said. Also up for discussion will be United States proposals with the potential to restrict the scope of Australia’s pharmaceutical benefits scheme and to further extend the term of copyright. Australia agreed to extend the term from 50 years past an author’s death to 70 years when it signed the US-Australia free trade agreement in 2004. The US is also proposing tougher intellectual property restrictions on use of material from the internet.
. What on earth is our trade minister doing?